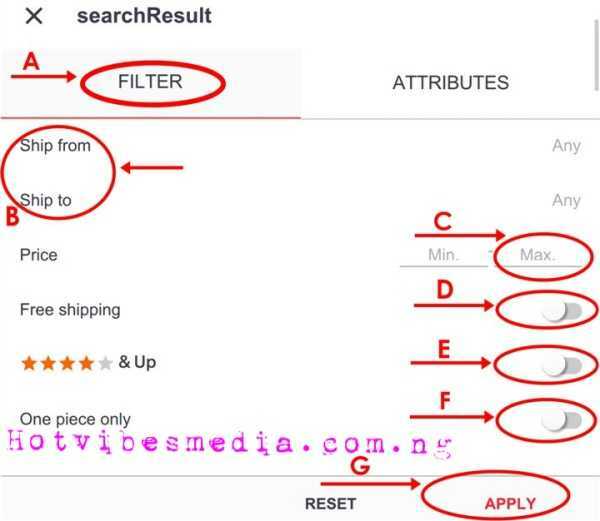 In this post I will show you how you can shop on AliExpress from Nigeria. cheapest rate ever but they actually don't know how to go about it,today am going to write about an easy but comprehensive way to shop directly from AliExpress in China without any issue and fuss. I have been shopping from AliExpress for over two years now,this post will teach you how to shop effectively and how to avoid mistakes I made when I newly started shopping on AliExpress. Screen shots will also be included for those that are not internet savvy and also those apprehensive about online transactions. To properly make use of AliExpress website,i suggest you have access to the mobile view of the website and also the Desktop view. What is Ali Express and Ali Baba? Ali Express is a chinese company based in China.It is a subsidiary of Ali baba Group Holding Limited. It was founded by Jack Ma with the sole aim of selling Chinese products to the world at large. Ali Express as of 2015 is estimated to be worth around 212 Billion. The website has over ten million chinese products for sale. Alibaba/ Ali Express is the most dominant retailer in the world,it generates more revenue than United States Walmart,Amazon and eBay combined together. The popular Uc web is also a subsidiary of the Ali Baba group franchise. Ali Express offers you millions of Chinese products at single and wholesale prices at an affordable cheap rate.You can make a lot of profit by ordering from Ali Express China and then re selling and making a lot of profit. Buying in whole sale and selling in retail in your country. How to Shop from AliExpress? Ali Express is basically an online shopping mall with over ten million chinese products. 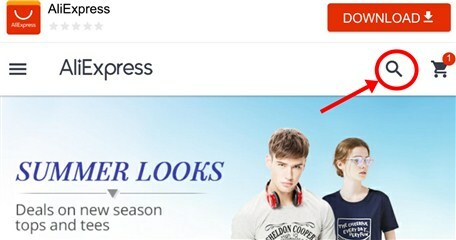 In other to shop from Ali Express you need to register an account before you can get started. 2. 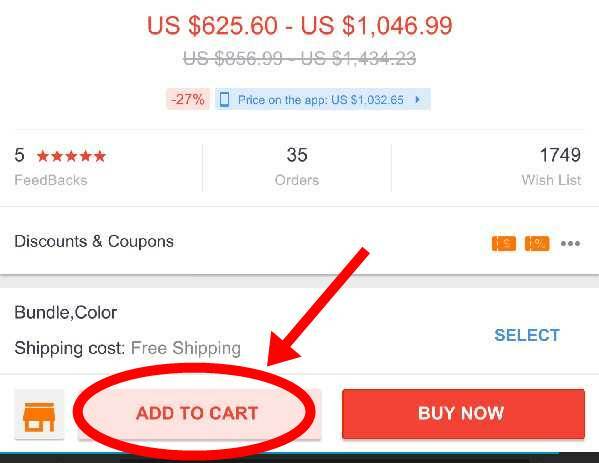 Click On "Join Free" in the top-left corner of any AliExpress.com mobile page as seen on the screenshot below. 5. Enter the Code Shown, and click 'Create My Account'. After filling in the details correctly automatically you will be logged in into your profile. Below are links to some of the items sold at Ali express,you can click on it to check it out. Now your logged on to AliExpress, apparently your intention is to shop and order an item you want. There is a difference between shopping and shopping smart online,your main aim should be to shop for the highest quality at the cheapest and lowest price. Before we get started you need to make sure you have the following ready. As an online shopper you need to have a funded master card or a visa card that you can use to buy from AliExpress. Items are sold in American dollars,assuming you don't have a dollar master card or visa card,you can still be charged in dollars,then your local bank will deduct the amount charged in your own local currency. You can also make payment via Wire Transfer, Western Union, Web Money, and Maetro Debit card. Before completing an order on AliExpress you need to provide a valid home address for shipping in other for your ordered item from china to get to you. Make sure that you are using a valid telephone number in case you need to be contacted.You must have already opened an AliExpress account and have all the essentials listed above. 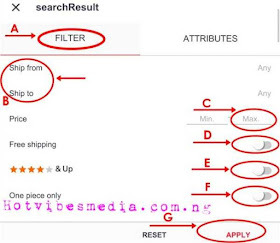 This is the first step,you have to search for the item you want from millions of products,like I said,its better to shop on both AliExpress mobile site and full site. For searching i recommend searching through AliExpress mobile site. The advantage of using the mobile site during making a search for an item is that you will be able to make customized searches based according to your budget and narrow your searches to get your desired item. Now your logged on to the mobile site,click on the search icon on the top right of the site as seen in the screenshot below. Search for the item you want to buy,for example let me search for a new 'mobile phone'. Make sure you type the keyword of what you want to shop. Automatically you will see hundreds of items matching your description. Now its time to customize your search according to your budget,check Out The Custom Search Screenshot below,and what each setting mean. Click on the knob to activate Free shipping (D). 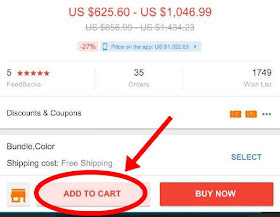 Free Shipping (D) : Using this feature to search automatically brings up items and products that offer free shipping, that means you will not have to pay for shipping. Price (C): Input the maximum amount that you are willing to spend for an item. The system will display items according to your budget. It will also display products/items cheaper than your initial budget but never over your budget. 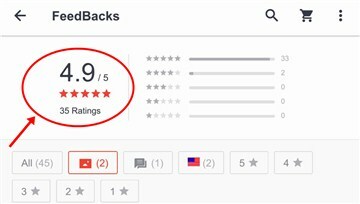 Star Rating(E): Click on the star rating knob to activate it,you would want to shop from sellers with high customer rating right? One piece only(F): click to activate this if you only want to purchase a single item. Ship from Ship To(B): No need to use this feature because Ali Express ships to many countries worldwide. After activating this setting, automatically you will be able to see good products within your budget range. One of the good features of shopping on AliExpress is that as a shopper you can check the ratings of the store you want to purchase an item from. Before you buy an item from any store check out the following. Check stores rating by checking the number of stars as seen in the screen shot below. Click on feedback scroll down and read the comments of previous buyers,some previous customers attach pictures of their received item and give details about the product,you should go through this thoroughly. When you are satisfied with the seller and the product being sold you can go ahead and do the following. After you have done that,make sure you select the products attributes like the color,size,length weight etc of the item you want. You can add an item to a cart and continue shopping,you can even log out,whenever you log in,items added to your shopping cart will still be available. Some seller's do offer discount on bulk purchases and wholesale sales,a seller also can ship all your items together at a lower rate,have a chat with the seller,a very good seller will assist you in every way necessary. Shipping Mode: If the seller offers free shipping for an item,it will take time before you receive your item,for example shipping From China to Nigeria via China Post Registered Air Mail ships within 60 business days,that's approximately two months, but if the seller ships your item fast,you will receive your item before 60 business days,normally your supposed to receive your ordered item before 60 business days,between approximately 16-41 business days . And some other methods that you can see when you access the full website. Shopping Tip: When paying be sure that you do not to pay for an item twice,whenever your about to pay for an item and you experience bad internet connection or the transaction page hung and didn't show 'payment successful',don't continue with the payment or try to refresh the present page or try to put in your card details again,don't do this,you will end up paying for an item twice,what you should do is to go back and refresh your shopping cart to see if the item has left the shopping cart i.e been paid for,if the item is no longer listed in the shopping cart that means the item has been paid for,so don't bother paying,check your order list to be sure the paid item is listed,if however the item is still in the shopping cart then it means the payment wasn't successful,go ahead and initiate another payment transaction. The total amount to be paid will be summed to be paid with the credit card you filled in see screenshot below. A screen prompt will appear on your check out screen,including the amount your about to pay for,if your satisfied go ahead and click on 'PAY'. After the system has processed your payment card and the transaction was successful,you will receive another prompt thanking you for the purchase for example check out the screenshot below thanking a customer after receiving his payment. After the successful payment of your item,you will be notified,an email will be sent to you saying that your Payment has been accepted,your payment will then be verified, this takes around 24 hours or less,after that the supplier will begin to process your order for shipping,during this time you are unable to do any operation on your order. When the verification is complete you will also be notified via email,after some time withing 1-7 days the seller will ship your item and you will also be notified via email. After ordering and paying for your order,you should log in frequently to track your order in other to know when it arrives your country. You can track your order via AliExpress full site or Mobile site,Just proceed to your order list and click on tracking as seen in the screenshot below. Another page will open,you will be be able to see updates concerning your ordered item. You can communicate with the seller that you purchased an item from. You can ask questions about the items you bought,a good seller will reply swiftly. To message a seller click on contact seller to message your seller as seen on the screenshot below,from the full site. Actually it is very annoying to wait for a long time for expecting your ordered items to arrive arrive and they end up not arriving or maybe taking months to arrive. Probably the seller didn't send the item out on time or some logistic glitches, maybe the custom agencies in your country didn't clear the item,whatever the case maybe,you should contact your seller as explained in step 7. If its then a case of delayed shipping or whatever contact the seller,inform them about your request to extend your Purchase Protection, you can contact the seller directly or click 'Request to extend Purchase Protection' make sure you ask first for the seller's approval,if the seller is not responsive then you can open a dispute before the end of your purchase protection. Login to the full site to access this feature. 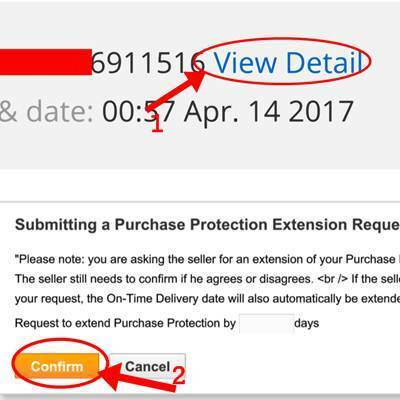 From your ''all orders'' section click on ''view details'' of the order you want to extend purchase protection. Purchase Protection helps to protect the buyer and the items purchased within a specific number of days,if you haven't received your ordered item withing the specified number of days,you should extend it in other to be eligible for protection from AliExpress,if you do not extend this,then automatically the system will mark your ordered item as delivered,and in the scenario when you haven't yet received your item,there is nothing you can do about it. After a couple of weeks your ordered item arrives,for people in other countries your item might be brought straight to your apartment. For other countries you might be required to come to the postal office. For example AliExpress customers in Nigeria usually receive an sms notifying them of a foreign parcel from the postal office,your expected to come with a photocopy of either your drivers licence or any national form of identification. This is valid only if you shipped your item via China Post Registered Air Mail,if however you paid for DHL shipping or EMS,your item might be delivered to you at home. Depending on item ordered, you might be required to still pay some amount at the collection point at the postal office if you shipped via China Post Registered Air Mail. 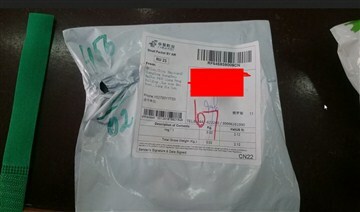 If however you do not receive your ordered item ordered via China Post Registered Air Mail within 23-42 days,you can then apply for a refund by opening a dispute,that issue is discussed better in step 10. In some cases what you ordered is not what you receive, pictures sometimes are deceptive,in a situation when you are not satisfied with the product you can click on 'Open Dispute',before Purchase Protection deadline expires, else your Purchase will be automatically finalized. You however need to be logged on to the full site to have access to this. If you clicked on ''open dispute'' you might get a full or partial refund from your seller. If however your satisfied with the item or product received You can click 'Confirm goods Received' as seen on the screenshot below. Go ahead an rate the seller and give your own review to help other buyers. As for those that are not satisfied and has 'opened dispute,you might be fully refunded on the amount you spent or the seller will send the specific item you want. There was a case when I ordered a product and the seller sent the wrong item,the seller promised to give me a refund but eventually he didn't,so its always good to identify good sellers and make sure you order an item based on the specification of what you want. Always log in to check and track your ordered item. AliExpress does not have an efficient live customer care unit,all they have is already answered automated questions and answers. You cannot send an email to its customer care and get a response,overall its a good website to shop from and its quite affordable, with time you will get smarter and accustomed to shopping on AliExpress. What has your own shopping experience been like on AliExpress.com? Tell us in the comment section below. even a pro would learn one or two from here..